Welcome to the one month (minimum of one week) Ashtanga Yoga Retreat with Petri, Wambui and their great professional assistants. Purple Valley Yoga Retreat is located in a peaceful valley in Assagao, North Goa, between the Arabian Sea at Anjuna beach and the small market town of Mapusa. Set in landscaped tropical gardens there are communal areas for eating and relaxing and private spaces for contemplation and meditation, it is quiet and safe, and the ideal place for a yoga retreat holiday. The morning walk to the yoga shala is through the tropical gardens of the yoga retreat with the scent of frangipani in the air, the sun rising over the field of palm trees and the birds and cicadas singing. The shala itself is an amazing temple like space with a peaceful energy. 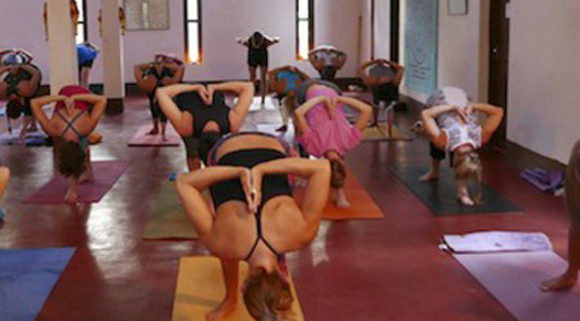 It is a perfect place to deepen and explore your yoga practice.